As a club actively engaged in both rowing and community, we welcome visiting rowers as part of our programs. Prospective members and out-of-town visitors can contact the club registrars/membership team to arrange a row with us. In your note, please indicate your rowing experience, how long it has been since you rowed, and whether you are interested in sweep rowing, sculling, or both. Additional notes below. We look forward to getting you on the water with us! Experienced, currently active rowers who are not prospective members are welcome to join us for a guest row during their travels. We ask guests to please consider a donation (suggested $20) to subsidize costs of guest rowing sessions. 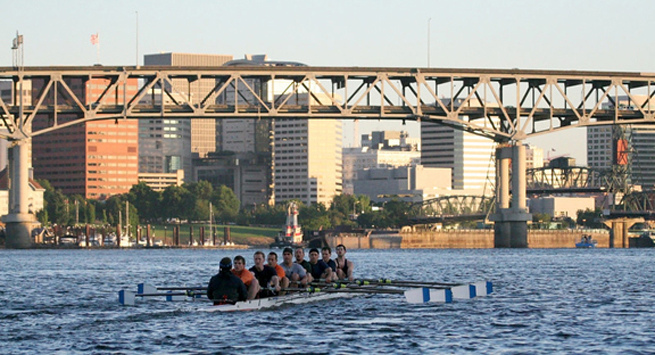 If you have rowing experience and are interested in getting back in a boat with us as a member, join us for a practice with one of our programs to try out the club before joining. We offer up to three rows to prospective members before asking for some form of a membership commitment. We are located at 1515 SE Water Ave, Bay #2 (second from the left as you stand behind the building with your back toward the river). Parking is available behind and to the sides of the building; please note we are limited to on-street or visitor parking spots after 7:30am on weekdays (you will get ticketed). The boathouse is also accessible by a number of transit options, including TriMet bus lines 4, 6, 10, 14, and 33; we also have access to a locked bike parking cage (bring a lock to lock your bike to the racks).